Hi! A couple of weeks ago I talked about how I was wanting to start creating my own cosplays of Sentinel of the Multiverse characters and others. Well, not only am I sewing and working on stuff for my own cosplays, I am creating some for my boyfriends too. 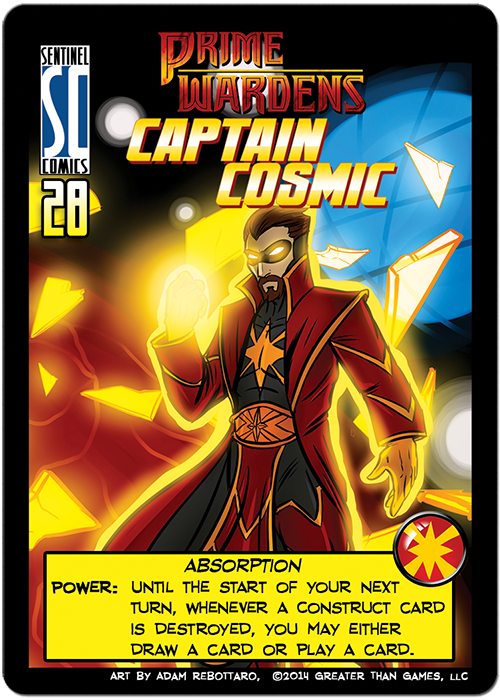 One of the characters he is wanting to cosplay as is Captain Cosmic, who is also from Sentinels of the Multiverse. Captain Cosmic is a newer character to the card game, he only came out a year ago! After a night of stargazing with his brother and an accident he woke up to find he had new powers and a missing brother. (More of his back story and information is a click away when you click on the image.) Anyways, he later joins a group called the Prime Wardens, and his promo card is shown on the left. Yep. That specific design is what he wants to cosplay. I am sewing/creating all of that. So the first big project is the jacket. I already have the material for it and found a pattern at my local fabric store for Civil War-era jackets that I think I can redesign for this big project. I will have to go out and buy under-armor like material for the star on his chest since we have a shirt for that part. Not to mention those thigh-high boots which might be a challenge. I called this “Part 1” because I feel like this will be a long and time-consuming task ahead of me. I will only be able to gather materials until the semester ends, but hopefully it will be worth it. Personally I am excited to take on such a task!